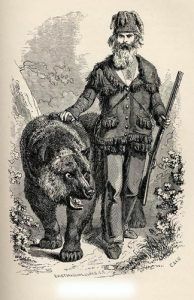 John C. “Grizzly” Adams (1812-1860) – Adams was a professional hunter of grizzly bears who became well-known when he became involved in P.T. Barnum’s Circus. James Aird (1757-1819) – A Scottish fur trader, Aird spent nearly 40 years among the Dakota Sioux in what is now Iowa and Minnesota becoming a prominent fur trader at Mackinac, Michigan and Prairie du Chien, Wisconsin. John Davis Albert (1806-1899) – Born at Hagerstown, Maryland and raised in Pennsylvania, Albert made his way west when he grew up. In 1833, he traveled by keelboat from New Orleans to St. Louis, Missouri and from there headed to the Rocky Mountains, where he lived for three years. By 1838, he was farming near Taos, New Mexico and barely escaped the Turley’s Mill Massacre in 1847 at Arroyo Hondo, which was an extension of the Taos Revolt during the Mexican-American War. He later settled at Walsenburg, Colorado about 1872. He died there on April 24, 1899. Cyrus Alexander (1805-1872) – A frontiersman, Alexander was a trapper with William Sublette before becoming a miner and agricultural pioneer in California. Manuel Alvarez (1794-1856) – A mountain man, trapper, and trader who turned politician. Alvarez was born in Albegas, Spain, but by 1818, had crossed the ocean and was in Mexico. He then made his way to New York, then to Missouri, and was in Santa Fe, New Mexico in 1824, where he engaged in trading for several years. He then entered the Rocky Mountain fur trade as a free trapper, before later joining with the American Fur Company. He left the mountains in about 1834 and returned to Santa Fe, where he continued as a trader and showed an interest in politics. After the acquisition of New Mexico by the U.S., Alverez became a leader in the territory becoming a state. Afterward, he held several political offices before he died in July 1856. Louis Ambroise (1801-1842) – A trapper and trader in the Colorado Mountains. Ambroise was born at St. Louis, Missouri in 1801 and when he grew up he headed southwest, reaching Taos, New Mexico about 1822. He married a Spanish woman in 1824 and was working as a trapper. In 1827, he was part of Sylvestre Pratte’s party trapping in the Colorado mountains. He was badly wounded by Southern Ute Indians and while trying to recover with Cheyenne Indian friends, they put an end to his misery on August 15, 1842. American Fur Company (1808-1842) – Founded by John Jacob Astor in 1808, the American Fur Company would become one of the largest businesses in the country at the start of the 19th century. Captain Juan Bautista de Anza II (1736-1788) – A Mexican-born trailblazer and explorer, de Anza was the first person of European descent to establish an overland trail from Mexico to the northern Pacific coast of California. John Jacob Astor (1763-1848) – Astor, who formed the American Fur Company, was the head of the Astor family dynasty and the first millionaire in the United States. Francois Xavier Aubry (1824-1854) – Aubry was a French Canadian merchant, wagon train captain, and explorer of the American Southwest. His achievements include speed records riding the Santa Fe Trail and early exploration of the 35th parallel north-west of the North American continental divide. Charles Autobees (1812-1882) – Trader, trapper and mountain man, Autobee worked with such notable men as William Bent, Ceran St. Vrain, Kit Carson, James Bridger, and James Beckwourth, as well as a number of Indian tribes. Lucas Vazquez de Ayllon (1475-1526) – A Spanish conquistador and explorer who tried to start a colony in North America in 1526. He was the first European colonizer of what is now South Carolina.